Performed, recorded and mixed by j.g.thirlwell at self immolation studios,brooklyn. Merci a: kitty hartl, david sefton, steve bernstein, matt johnson, alex hacke and danielle depicciotto, marita, marylene, tada, teho, rok, noel ackchote & magda blaszczuk, jim coleman, chris mcculloch, daniel langdon jones, norscq, clement tuffreau, quentin jennings, heung-heung chin and john zorn. 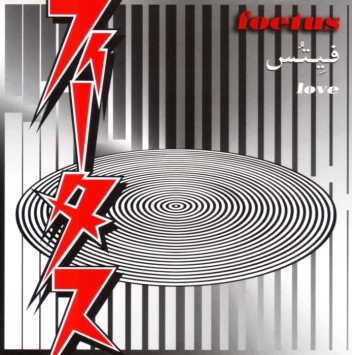 Love, Foetus’s brilliant return to recording after a five-year hiatus…. As he’s progressed, his work has become increasingly textured and intricately composed, often taking on a cinematic grandeur in the process….an immersive, emotionally charged tour de force from an underground icon who shows absolutely no signs of slowing down. …The album as a whole may feel like a far less dissonant and troublesome offspring than previous Foetus outings, which in some ways brings it closer to the spirit of the cinematic, orchestrated sound orgies of Steroid Maximus or the creeping electronic tension of Manorexia, Thirlwell’s two major para Foetus projects. But Thirlwell has kept his morbid sense of humour intact as well as his penchant for combining musical elements that few other artists would be able to manage to fuse together in the same song. Thus “Love” collides the sensual with the brute, the minimalistic with the baroque, harpsichord en masse with brutal guitars. What truly astonishes me is the way Thirlwell manages to push his skills as a producer and arranger as well as songwriter. The songs bristle with nuances, and the orchestral elements appear more fully fleshed out and realised than ever. “(not adam)” and “Blessed Evening” are perfected cinematic scenarios, with Thirlwell’s voice taking center stage supported by back projected orchestras going through the moves in a noir soundscape. “Mon agonie douce” sees him adopting a perverted Jaques Brel persona, but everything mutates into a blurry scenario where harpsichords are strangled in backalleys while Thirlwell’s sampler gets blackmailed into committing indescribable acts of perversions. “Aladdin Reverse” isn’t just a pun on David Bowie’s already punning “Aladdin Sane”, but also the most conventionally Foetus-sounding track – if there even is such a thing – in its anguished aggression. Over crashing guitars and roaring strings, a tormented Thirlwell lets us know that he’s not just “a lad in reverse”, but also “Dorian Gray in reverse”. It might be ironic, but it’s the most intense moment of an album that impresses with its ability to alter the Foetus DNA even further, bringing Thirlwell’s most persistent project farther into the evolutionary maze he’s been strolling through since 1980. That’s the Love experience. It may not sound anything like actual love, but when it’s over, you’ll feel as if you’ve been pulled backward through a hedge, beaten with sticks, jabbed with needles and thrown from a moving car. You might be alarmed at the prospect of diving into it again right away, but you’ll succumb in the end, drawn by the dazzling, breathtaking thrills and the optimistic belief that you know what to expect this time around. Thirlwell delivers the bombast, the brutality and the sleaze, as always: a series of emotional highs and lows, steeped in musical pop culture and infused with a healthy respect for excess. If it leaves you sweaty, shaking and tingling all over, that means it works, right.